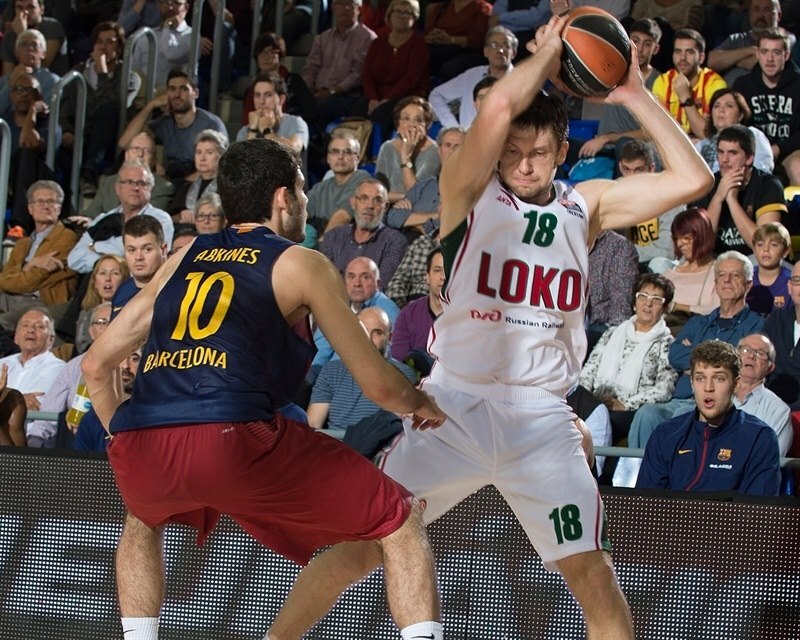 In a battle for first place in Group D, FC Barcelona Lassa registered its fourth consecutive win by edging Lokomotiv Kuban Krasnodar 72-68 at Palau Blaugrana on Thursday. The two teams are now tied for the best records in Group D at 4-1 record. 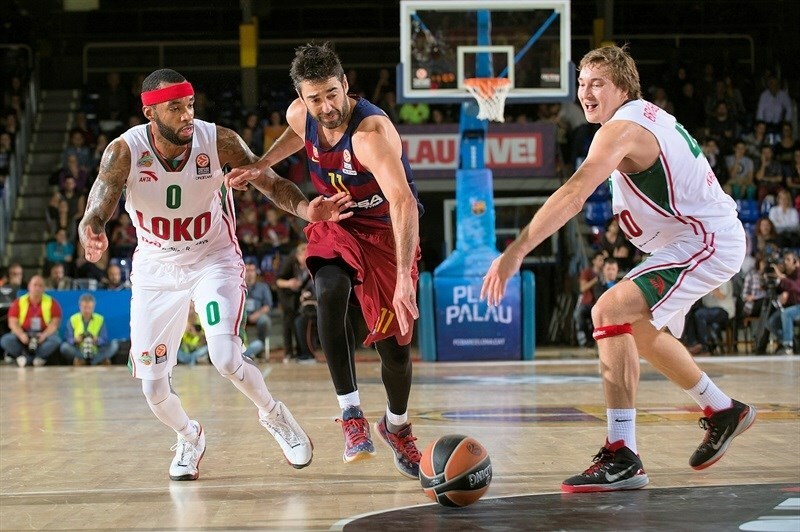 Ante Tomic led the winners with 16 points and 7 assists, while Tomas Satoransky added 10 points and a key steal for Barcelona. 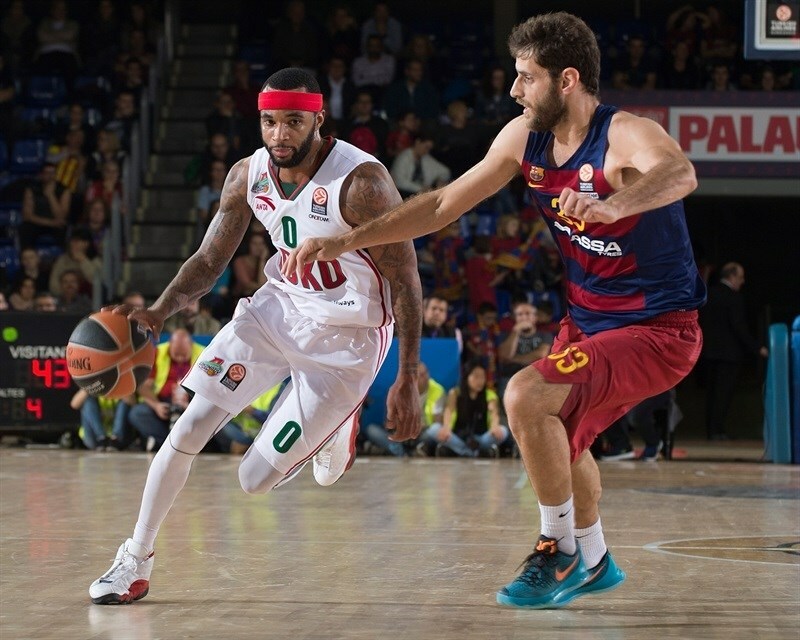 Dontaya Draper led Lokomotiv with 20 points and Malcolm Delaney added 18 for the guests. Tomic had 10 points in the first quarter and got help from Justin Doellman and Carlos Arroyo to give Barcelona an 18-16 lead after 10 minutes. 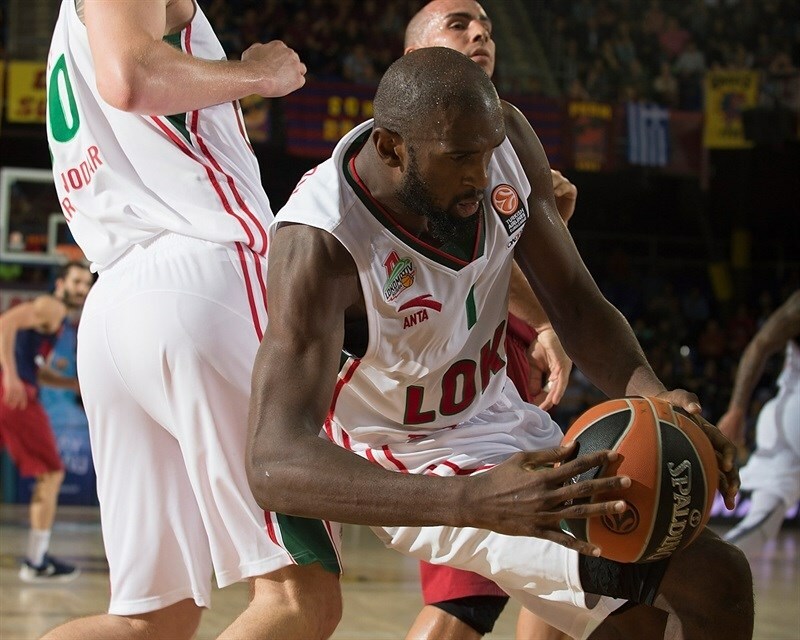 Chris Singleton and Delaney rescued Lokomotiv to tie the game at 28-28. 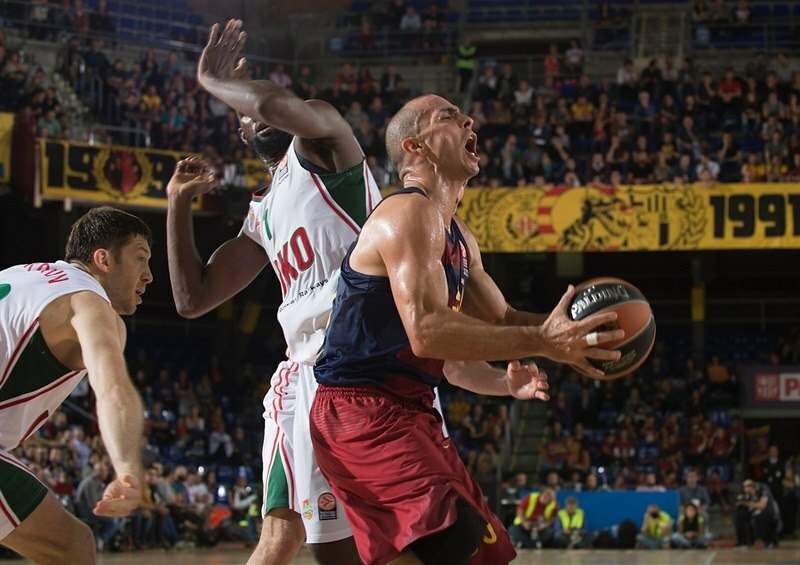 Brad Oleson, Tomic and a wild buzzer-beating basket by Pau Ribas helped Barcelona to a 37-31 edge at halftime. Barcelona lead 42-33 right after the break but Delaney, Victor Claver and Draper led a 4-14 run to take a 48-49 lead at the end of the third quarter. Back-to-back triples by Singleton and Delaney made it 48-57, with eight minutes left. Barcelona returned to the game with a 9-0 run, which Samardo Samuels capped with a layup, and regained the lead, 65-63, on a three-pointer by Alex Abrines. 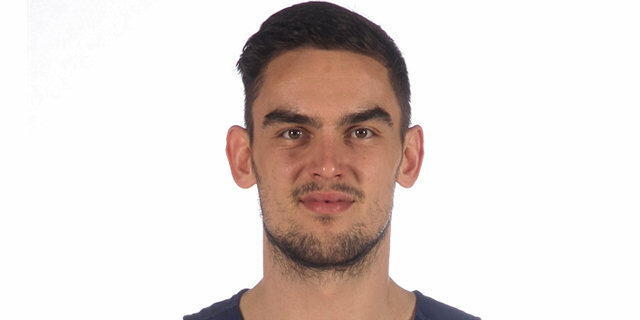 Delaney singlehandedly brought Lokomotiv within 70-68 and the guests got the ball back with 7.8 seconds, but Satoransky collected a good-as-gold steal and sealed the outcome from the foul line. Tomic got Barcelona going with a layup, which Claver erased with a driving basket. Tomic insisted with a big basket in the low post and a jump hook for a 6-2 Barcelona lead. Singleton buried a mid-range jumper, which Doellman bettered with a bomb from downtown to boost the hosts' lead to 9-4. Lokomotiv struggled to get Delaney involved due to Satoransky's defense, but Evgeny Voronov stepped up with a backdoor layup. 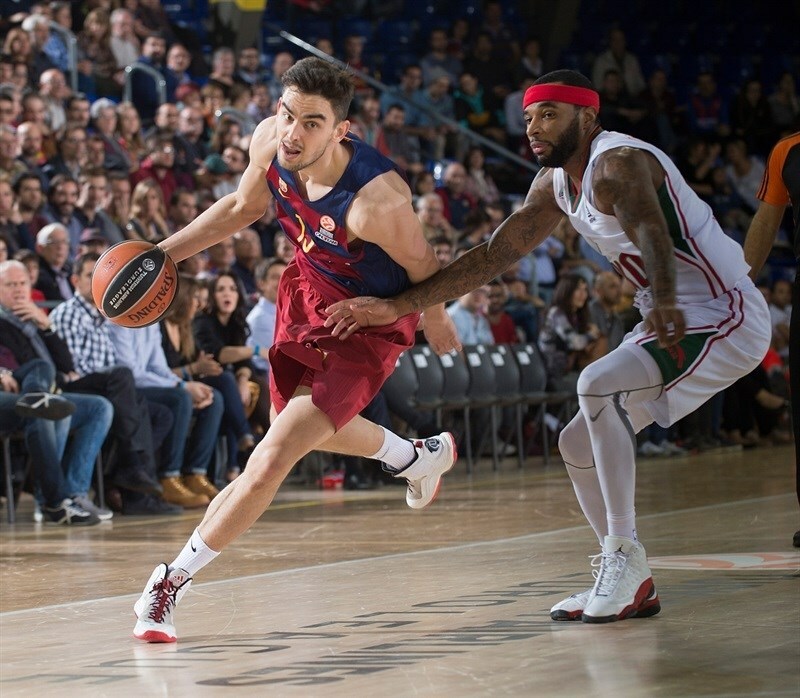 Satoransky shined with a driving basket and free throws by Tomic gave Barcelona a 13-6 advantage. After Delaney made foul shots, Tomic hit a mid-range jumper. A jumper by Draper kept Lokomtoiv within 5. Draper kept pacing the guests with free throws. 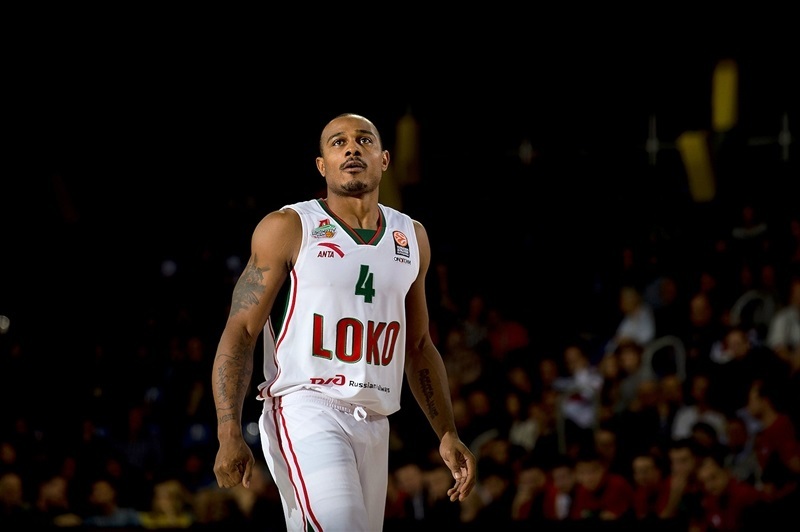 Shane Lawal split free throws and a layup by Kyrylo Fesenko brought Lokomotiv within 16-14. Delaney took over with an acrobatic basket, but free throws by Carlos Arroyo fixed the score at 18-16 after 10 minutes. Draper scored around the basket and a three-pointer by Ribas put Barcelona back ahead, 21-18. Abrines split foul shots, as Lokomotiv tried to push the game tempo, but kept missing open shots. 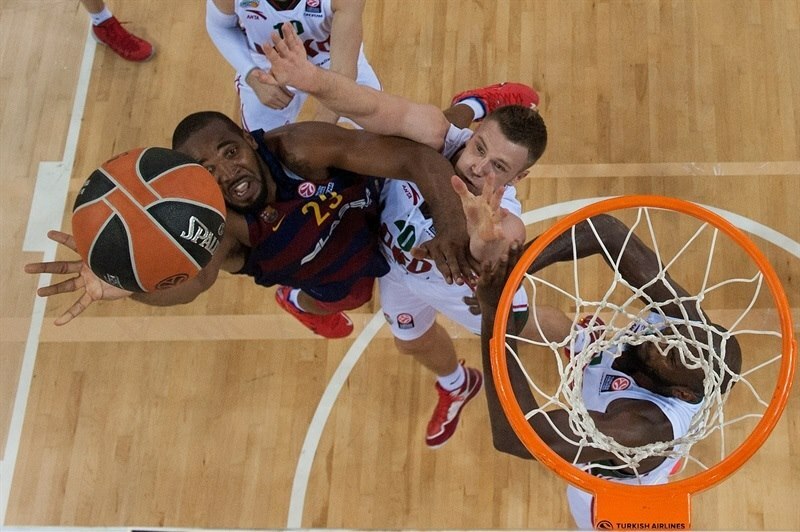 Barcelona dominated the boards with Lawal and Samuels together on court. Samuels made free throws, but Singleton took over with back-to-back dunks that got the guests within 24-22. Ryan Broekhoff split foul shots before Lawal made 2 attempts and Arroyo restored a 28-23 Barcelona lead. Lokomotiv struggled to score without Delaney and Draper on the floor, but Sergey Bykov rescued the guests with an acrobatic basket. Delaney returned to the floor and immediately struck from downtown to tie it at 28-28. Abrines made free throws, as Barcelona tried Ribas and Brad Oleson as guards. Oleson hit a mid-range jumper and Tomic made free throws, but a three-pointer by Draper kept Lokomotiv within 35-31. A buzzer-beating layup by Ribas boosted the hosts' lead to 37-31 at halftime. Tomic split free throws right after the break and Broekhoff found Voronov for an easy layup to bring the guests within 38-33. Tomic scored around the basket and send a behind-the-back assist to Satoransky for a 42-33 Barcelona lead. Delaney scored in penetration and Draper sank a jumper in transition. Claver picked up a loose ball and put it in, which Delaney followed with a fast break layup to make it 42-41. 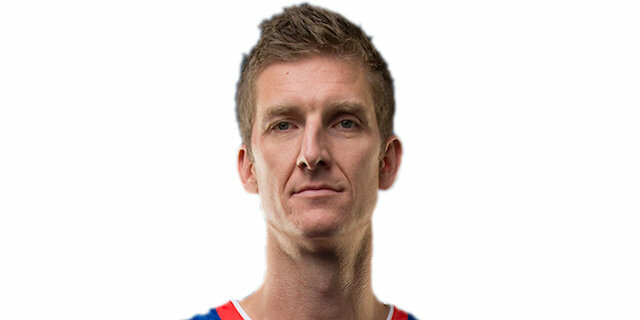 Doellman tried to change things with a dunk, which Claver erased with a layup. Juan Carlos Navarro hit a mid-range jumper, but a close basket by Fesenko and a fast break layup by Andrey Zubkov gave Lokomotiv its first lead of the game, 46-47. Barcelona kept struggling to score without Tomic on the floor and another fast break layup by Draper prompted the hosts to call timeout at 46-49, after a 0-6 run. 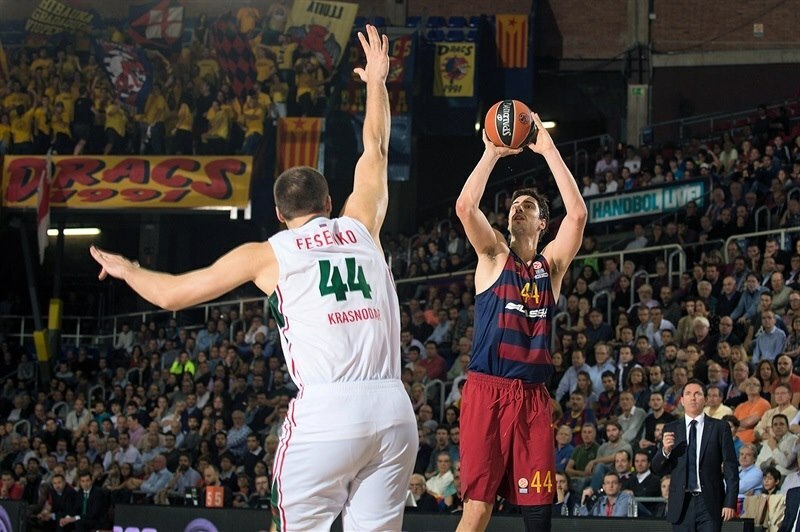 Ribas made free throws to bring Barcelona within 48-49. Both teams struggled to score until Zubkov stepped up with a tip-in. Singleton soon added a corner triple to make it 48-54 with eight minutes left. Delaney and Oleson joined the three-point shootout and Abrines sank a six-meter jumper that brought Barcelona within 53-57. The hosts improved their defense and a layup by Satoransky made it a 2-point game. Samuels shined with a reverse layup that tied it at 57-57, after a 9-0 run. Draper struck from downtown and bettered Satoransky's quick basket with a seven-meter bomb for a 59-63 Lokomotv lead. 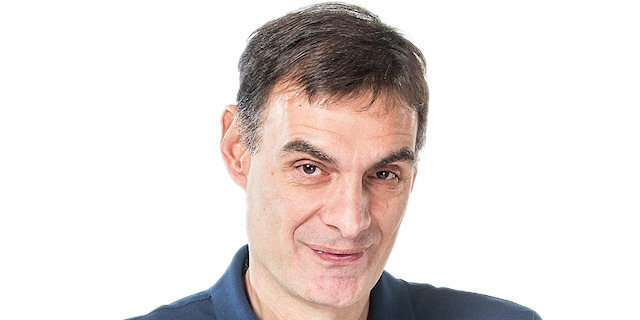 Oleson buried another one from beyond the arc and so did Abrines to put Barcelona back ahead, 65-63, with over two minutes to go. Tomic split free throws and collected a key steal which allowed Samuels to score at the other end, 68-63. Draper split free throws, but Samuels scored again. Delaney hit a three-pointer and was fouled while taking another shot from downtown. He made 1-of-3 attempts, but Lokomotiv got the ball back with 7.8 seconds left. Satoransky stole the ball, drew a foul and made free throws to seal the outcome. "We are happy with this win and for the people that came to the arena, who saw an exciting game. We knew it was going to be a difficult game and that is how it was. We said before the game that Lokomotiv collects many steals and offensive boards. Some of the players did really well - Dontaye Draper played at a very high level and Malcolm Delaney did as well as usual. We had the game under control until halftime. They scored some tough shots to stay in the game. We played our worst basketball in the third quarter. 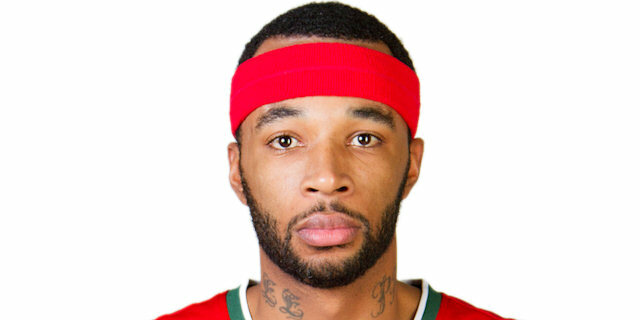 Lokomotiv plays aggressive defense and took 27 free throw attempts. We had a good comeback when things looked hard, worked well and managed to win the game. Congratulations to everyone for our 250th win in the Euroleague, to everyone who made it possible. We are the second team that reaches his very interesting number." "We feel sad, obviously, because we lost the game the way we lost it. We competed and had an excellent game, took a nine-point lead and just had to control our emotions, stay focused on every defense, something that we didn't do. Barcelona, after the timeout, found different players with open shots, moved the ball and made three shots in a row. They came back very quickly but even with that, we had our chances to win the game. We had 3 turnovers in the last 2 minutes and finally lost this game. I am satisfied with our effort but not for the result. You don't have many chances to beat Barcelona on the road. Everybody can realize it is very difficult to play, compete and win. We competed and did a good job but at the same time, we had the chance to win the game and didn't. It is a lesson for us. We have to keep working. 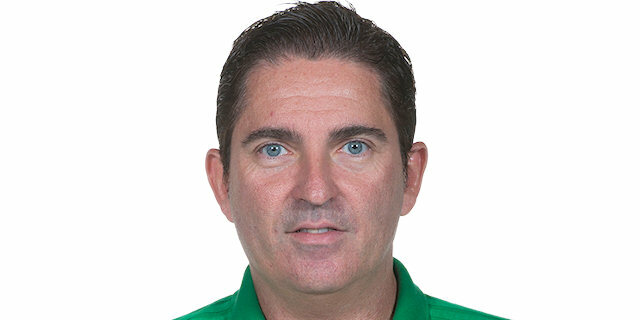 We are 4-1 after the first round of games and need 1 or 2 more wins to qualify to the Top 16, which is our target." "The most important things is that we got the win. We didn't play very well today and to give Lokomotiv credit, they played on defense and slowed us down. We got a bad rhythm, but in the end we played hard and won the game, which is most important. Ante Tomic played well. He carried us and had a lot of big buckets and was passing the ball really well at the end of the game. 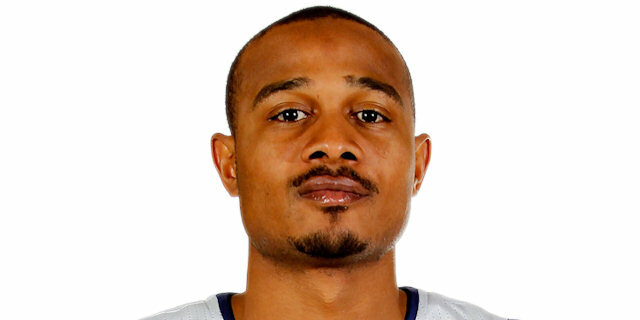 He got Samardo [Samuels] a couple of easy buckets, which was great." "It was a balanced game that went down to the final seconds. It gave us a chance to be first and this is why this is a very important win for us. This gives us confidence for the upcoming games. It was a really tough game for us. They played very aggressive defense and we had a lot of turnovers, which made things even more complicated for us. We managed to return to the game in the final minutes and won on the final play, even when they hit a lot of shots down the stretch. We are happy for the way we bounced back but we have to cut turnovers against such an aggressive defense." "We had a lot of opportunities to win the game. We had control of it in the fourth quarter and we just, lack of defense. We’re confident, I think we can beat them. We just can’t let them go on runs and they went on a run at the perfect time. At the end of the game they hit 3 threes. And a team like that at home is tough to beat when you don’t capitalize on the lead you have. " "We came here to win the game, not just to be a part of playing against Barcelona. I think it’s a good learning point for us, because we were up 10 points and we have to do a better job of finishing the game. Barcelona is a great team and they made a big run. Our team is made of hard work and staying together as a team and hopefully we can get back on track for the next game. "